Top of North Table Mountain, on the west side of an ephemeral pond in the northern part of the mesa, beside Mesa Top Trail, near the radio tower, 3.4 km. north of the GNIS location of Golden. 39.7855°N, 105.2142°W. WGS 1984 Elev. 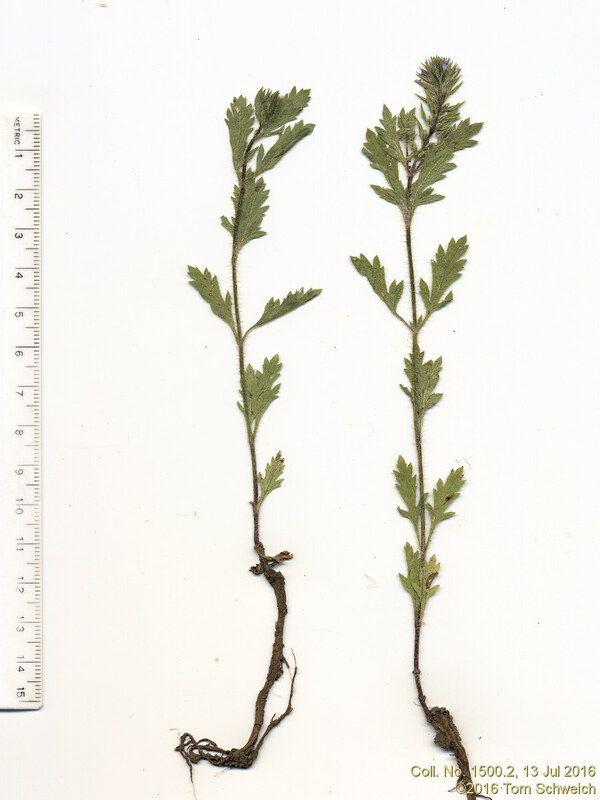 1968 m. Erect, perennial, damp soil near pond. Coll. No. 1500.2, 13 July 2016, characters observed: Perennial herb, to 15 cm., erect; Leaves, cauline, opposite, petiole 5 mm. + blade 20 mm. × 10 mm. wide, pinnafitid, toothed; Bract, 11 mm. × 2.2 mm. wide, entire; Calyx, 4 mm. × 1.5 mm. wide; Corolla, lobes, #5 tube 4 mm. + throat 1 mm. + lobes 2 mm., limb, 2.5 mm., color blue; Introduced. Usually seen as a prostrate trailside herb. However, this one was growing in grasses and herbs, and forced to adopt an erect habit. Mesa Top Trail, Jefferson County, Colorado: near pond. Field Notes: Coll. No. 1500.2, 12 Jul 2016. Other photos about Species or Verbenaceae Verbena bracteata.